The term “root canal” usually makes people uneasy when they hear it. People often associate this term with pain. This is due to common misconception about pain or discomfort they may cause. Many people are mistaken about the pain and discomfort that this procedure may cause. However, the science has improved drastically to minimize this. In fact, root canals are a necessary procedure in order to save the tooth. The only alternative to a root canal is a tooth extraction. Whenever the central layer of the tooth becomes damaged from infection, bacteria from decay, or trauma, then the nerve (pulp tissue) needs to be removed. If the tissue is not removed, the tooth will continue to hurt and sometimes an infection will form. The root canal procedure removes the damaged nerve. 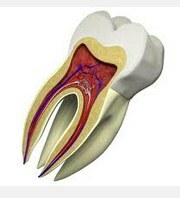 The inside of the tooth is then sterilized, sealed closed and can then begin to heal. Patients often feel an incredible amount of relief because the tooth is no longer painful. The entire procedure takes 1 to 3 visits and is done with a local anesthetic.